Agreed, A MWO would be great. This definitely needs more investigation. In fact, I am willing to further this line of investigation with a trip to Vietnam Please forward the first class airfare tickets, five star hotel reservations, chauffeured limousine reservation, and expense account details to me in a PM. Dear Ken, you can add the other picture I sent you, I wish I knew how to do it. 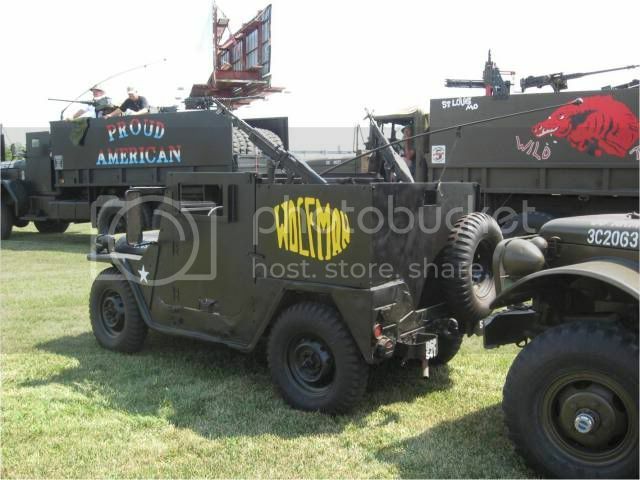 Attached is a photo of my replica of the 523rd Gun Jeep "Wolfman," taken at the gun truck reunion at Carlisle, PA last year. Had the 1/4-inch armor plate manufactured locally, using photos of the original Wolfman, and similar armored jeeps in the 523rd, for measurements. Have not added the bottom plate yet. The base vehicle is a 1966 Ford (similar to ones we brought from Detroit in the summer of 1966 to Fort Campbell, KY). The extra weight, with the bottom plate, will be about 1,000 pounds. Having trouble posting the photograph of Wolfman. Can anyone help? I'm an old guy with very little computer savvy. If you want to e-mail it to me I can put it up for you. rickf1985@comcast.net. in order to post them to the page you have to upload the photos to a web site like Photobucket and then copy the link to the page. One shot with a Tracer Round to that exposed gas tank and BOOM. I would not ride in that thing..Also, how does that thin sheet metal, hold that much extra weight bolted on ?? The armor kit for the M151 included material to construct a frame to which the armor plate was bolted. The two side plates were attached to the top of each rear fender using steel "L" stock. The entire setup was pretty solid. The 1/4-inch steel plate generally stopped small arms fire, with the exception of armor-piercing rounds, and B-40 rockets. However, the lid of the gas tank was still exposed (in order to be able to shut the driver side door), as was the radiator and hood area. And, of course, the tires. That makes sense ! !...How does the "jeep" handle with that extra weight ? Wolfman handles well, and the extra weight in the rear should help counteract the M151's tendency to lift the inside rear tire during tight cornering over 25mph. However, my use is mainly in a convoy, or parade, on fairly straight roads, at no more than 45mph. The crew of the original Wolfman eventually replaced the military tires with civilian tires, which made handling better on asphalt highways. The main highway traveled by 523rd Transportation Company convoys was Route 19, which by the end of 1967 was paved from Qui Nhon to Pleiku, about 100 miles. Thanks, Rick, for posting the pic. I'm working on learning how to do it myself. since early 1989, I will miss the Guy very much. unfortunately I could not afford it and after two three years I told my friend Paolo Marchi about it! He purchase it without even look at it! Last edited by GIBBO on July 11th, 2011, 10:55 am, edited 1 time in total. it should indeed handles better with all that weight!